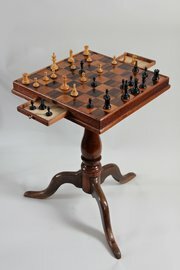 Antique Chess-Draughts Games Tripod Table. DescriptionUnwrap this handsome Games Table after Christmas dinner and sit back for some stimulating fun and games! 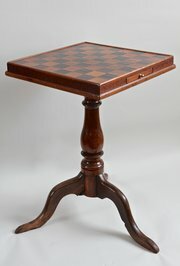 The mahogany top with an inlaid chequerboard, has a sturdy feel, due to a box construction to contain shallow drawers. 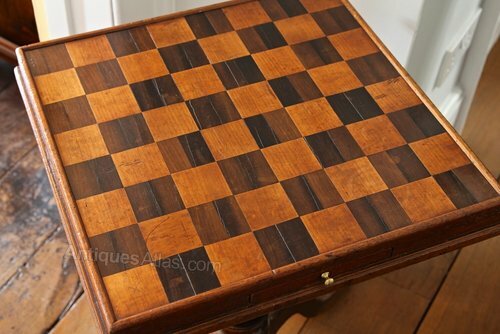 The 2 drawers contain a set of wooden draughts, and can also be used to place "taken" chess pieces.The base has a yew wood baluster column and oak legs. 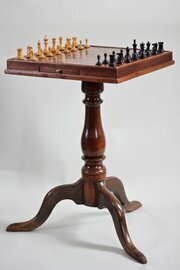 The top and base are 19th century in date but were not originally together, however they create a robust and attractive games table. Prichard Antiques, antiques, formal and country furniture from the 17th to 19th centuries. Oak coffers, Gateleg, farmhouse and mahogany dining tables, chests of drawers.